Mayor Booker: moving Nets to Newark "fixed in my mind"
Even as political officials in New York are hoping to position Atlantic Yards for federal stimulus funds, Newark Mayor Cory Booker says that the city's effort to lure the New Jersey Nets to Newark is "fixed in my mind." That comment came as Booker was interviewed last Thursday, February 5, on Newark Today with Mayor Cory Booker, a public affairs show on WBGO, Newark's public radio station, hosted by Andrew Meyer. 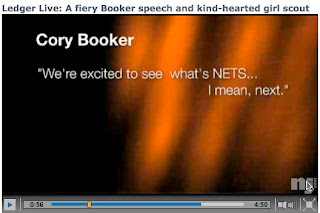 Booker was more circumspect Monday night, apparently not mentioning the Nets during his State of the City address. Actually, as the Star-Ledger's Brian Donohue explained in the video report Ledger Live, Booker's prepared--but not delivered--text included a planned slip. As the mayor discussed bringing different types of investments to the city, he was to say, "We're excited to see what's NETS... I mean, next." WBGO's Meyer was interviewed about Booker's speech yesterday, on All Things Considered , at about 38:15 of the second hour. Beginning at about 42:15, Meyer was asked what Booker didn't talk about. But the big question right now, one of the big questions in the city is: what's going to happen with the Nets. They're waiting for their arena to be built in Brooklyn. But many people are saying, "Look, you've got this brand new sports arena right in downtown Newark where the [hockey New Jersey] Devils are playing... this would be an ideal location to bring the Nets. It's ready to go; they can just walk in and it's theirs." So, there's a lot of speculation about whether or not that team is going to end up here. Mayor Booker's holding his cards very tight to the vest on this one. We pressed him time and time again, and he'll just say that his staff would be very angry with him if he was to tip any details. But he says there are discussions going on there. On WBGO, "out on a limb"
Last Thursday, however, the mayor was not reticent. The sequence began at about 35:10 of the show; both Booker and host Meyer sounded notably enthusiastic. AM: --You read my mind, Mayor... When are they coming? What do you know? AM: Well, let me put out there what we know. We have a contributor here who's been tracking the project closely, and he's said basically that the Atlantic Yards in Brooklyn has ground to a halt, Bruce Ratner, the developer, is not moving forward with the arena, supposedly until all the lawsuits over eminent domain are settled, and they're not even due to go to trial until next year. You combine that with the lack of financing available for big projects and, y'know, the Brooklyn Nets seem more and more like a mirage. Actually, the eminent domain lawsuit will be heard in less than two weeks (and a decision in the EIS case is pending). Forest City Ratner executives assert that construction would begin in mid-2009. CB: I'm telling you right now I have it fixed in my mind. Every single day I think about it, that we're going to have the Newark Nets one day. It's taking a lot of work on both sides of the river, and there are a lot of people from Brooklyn to Newark that believe that that team belongs here. What it's going to mean for our city is, just like the bars and restaurants that I was around [downtown], on Super Bowl Sunday. It means another 50 nights of tens of thousands of people coming to the city of Newark. It means parking tax for the city, payroll tax for the city, it means more economic development, more minority businesses are going to open up in our downtown through our loan fund. It would make a tremendous difference, and create an incredible excitement, it's something I'm working very hard on, and I'm hoping that will be successful. Meyer also brought up the dispute about the $2 million rent the New Jersey Devils, the primary tenant of the Prudential Center, allegedly owe the city. Booker said the issue was in arbitration and "I will not yield." However, he said that the Devils "make a tremendous amount of contributions: to the community, so, while the city should demand every dollar it deserves, it should "continue to build the strength and steam of that institution." Meyer brought up complaints that it costs $40 for parking near the arena. "Those are midtown Manhattan prices," he said. Booker's response: "What I'm going to simply say is take public transportation... We're perfectly located in the middle of a great transportation hub." He also pointed out that, if visitors were willing to walk, parking was less costly a little farther from the arena. Um, I parked right across Mulberry Street, within 40 feet of the Arena on Saturday night for the Devils-Kings game and it only cost me $25. I don't know where this $40 parking lot is, but even if it exists, you can always do like I did on Monday night for the Devils-Rangers game and park on one of the streets in the Ironbound for free. While it may cost $40 to park in certain locations in Manhattan, Newark is NOT Manhattan, and it presents Newark in a negative light (price gouging). Further more, it is a very common practice in Manhattan to have "Event Pricing", which is a discount to the normal price - parking garages around Madison Sq. Garden do this during Knicks games (approx. $23), and I just recently went to the Intrepid Museum in Manhattan and paid $16.23 (incl tax) for event parking. Lastly, the current parking rate at the Izod Center is $12 and if you purchased VIP parking in advance of the season, it's $10 - if you tell me I'm going to pay 2-3 times more for parking, I'm probably not going to go to as many games. Newark is in a rebuilding stage, and is beginning to be seen in a more positive light, the last thing you want to do is try to compare yourself directly to Manhattan and state that you think the city deserves the same pricing - you want to offer alternative pricing - charge lower prices that encourage people to come to your city...and then further down the line, when the city is more well established as an equal or better alternative to Manhattan you can increase pricing (a little). In hard economic times, keep pricing low and you make it up on the increased volume (have "Park Free" night 1-2 times per season, and market the heck out of it!). I think Newark can be a great city, hopefully they won't derail themselves by focusing on the short-term profits - please focus on keeping the Nets in NJ, the profits will eventually follow. Jeffries: ESDC "nontransparent and unaccountable"